Greg Potter, PhD is the Content Director at humanOS.me, an online platform that uses a behaviour change model to help people lead more healthy lives. He creates online courses and other content to teach about the impact of lifestyle on health and recently spoke at the Biohacker Summit in Stockholm, Sweden on cutting-edge strategies for improving sleep. Greg is talking today with Dr. Tommy Wood about his research in the areas of circadian biology and metabolic health. They discuss the vital role of adequate sleep and the societal influences that undermine the quality of our slumber and our health. Greg shares his best and most actionable steps for improving your sleep, including the timing of exercise and meals, using caffeine and alcohol wisely, and even what to wear to bed. [00:00:46] Podcast: How to Track Effectively, with Dan Pardi. [00:01:04] What's a real British biscuit? [00:04:35] Eating later in the day associated with increased body fat; Study: McHill, Andrew W., et al. "Later circadian timing of food intake is associated with increased body fat." The American journal of clinical nutrition 106.5 (2017): 1213-1219. [00:05:00] Associations between self-reported sleep duration and health outcomes; Study: Potter, Gregory DM, Janet E. Cade, and Laura J. Hardie. "Longer sleep is associated with lower BMI and favorable metabolic profiles in UK adults: Findings from the National Diet and Nutrition Survey." PloS one 12.7 (2017): e0182195. [00:13:09] Effects of altered circadian rhythm. Studies: 1. Potter, Gregory DM, et al. 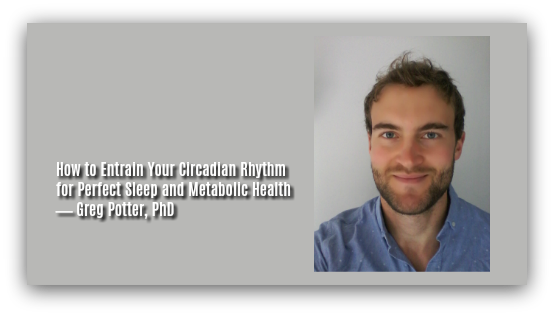 "Nutrition and the circadian system." British Journal of Nutrition 116.3 (2016): 434-442; 2. Potter, Gregory DM, et al. "Circadian rhythm and sleep disruption: causes, metabolic consequences, and countermeasures." Endocrine reviews 37.6 (2016): 584-608. [00:13:35] Metabolic consequences of reduced sleep. [00:17:27] Health effects of night shift work; Study: Kecklund, Göran, and John Axelsson. "Health consequences of shift work and insufficient sleep." BMJ: British Medical Journal (Online) 355 (2016). [00:20:24] Article: The Real Reason Why Spaniards Eat Late. [00:23:55] Rapid Eye Movement (REM) sleep. [00:24:44] HumanOS courses on circadian biology. [00:25:21] Study: Phillips, Andrew JK, et al. "Irregular sleep/wake patterns are associated with poorer academic performance and delayed circadian and sleep/wake timing." Scientific reports 7.1 (2017): 3216. [00:27:10] Light-dark cycle, blue light. [00:29:54] Light pollution; Study: Kyba, Christopher CM, et al. "Artificially lit surface of Earth at night increasing in radiance and extent." Science advances 3.11 (2017): e1701528. [00:30:17] Artificial light at night; Study: Wyse, C. A., et al. "Circadian desynchrony and metabolic dysfunction; did light pollution make us fat?." Medical hypotheses 77.6 (2011): 1139-1144. [00:32:46] Study: Toh, Kong L., et al. "An hPer2 phosphorylation site mutation in familial advanced sleep phase syndrome." Science 291.5506 (2001): 1040-1043. [00:35:37] Celine Vetter; Study: Vetter, Céline, et al. "Aligning work and circadian time in shift workers improves sleep and reduces circadian disruption." Current Biology 25.7 (2015): 907-911. [00:37:54] RAND group paper: Later School Start Times in the US: An Economic Analysis. [00:41:35] Studies: Rothschild, Jeffrey, and William Lagakos. "Implications of enteral and parenteral feeding times: considering a circadian picture." Journal of Parenteral and Enteral Nutrition 39.3 (2015): 266-270; and Grau, Teodoro, et al. "Liver dysfunction associated with artificial nutrition in critically ill patients." Critical Care 11.1 (2007): R10. [00:46:50] Meal timing; Study: Wehrens, Sophie MT, et al. "Meal timing regulates the human circadian system." Current Biology 27.12 (2017): 1768-1775. [00:47:41] Study: Kessler, Katharina, et al. "The effect of diurnal distribution of carbohydrates and fat on glycaemic control in humans: a randomized controlled trial." Scientific reports 7 (2017): 44170. [00:49:46] Dim light melatonin onset (DLMO). [00:50:14] Timing of exercise before sleep. [00:50:49] Greg’s tips for improving sleep. [00:57:08] f.lux, Twilight for Android, Night Shift for iOS. [00:58:10] HumanOS.me; Video: Greg Potter: Hacking Your Way To Better Sleep and Life (Biohacker Summit 2018 Stockholm).